We have discussed about Orta GTK theme in length before and also about the impressive Orta GTK theme + Faenza icon theme combination, which in my view is the best theme I have used with Ubuntu in a long time. Its so simple and eye-pleasing at the same time. The recent release of Orta 1.4.0 version brings in a number of important changes. What's New in Orta 1.4.0 GTK Theme? Most importantly, a new Nautilus Elementary breadcrumbs style. Nautilus Elementary zoom slider fixed. System menu icon size in now set to 16x16. Nautilus Elementary breadcrumbs now have a prelight state. Fixes for Gimp, Inkscape, Synaptic, Shotwell. How to Install Orta Theme in Ubuntu from PPA? Do the following in Terminal to install Orta GTK theme in Ubuntu. Done. Now goto System - Preferences - Orta Settings Manager and customize beautiful Orta theme in line with your tastes and needs. And as before, Nautilus Elementary is also highly recommended. If you have already installed Orta theme using Orta PPA, updates of the theme must be available already in your Update Manager. 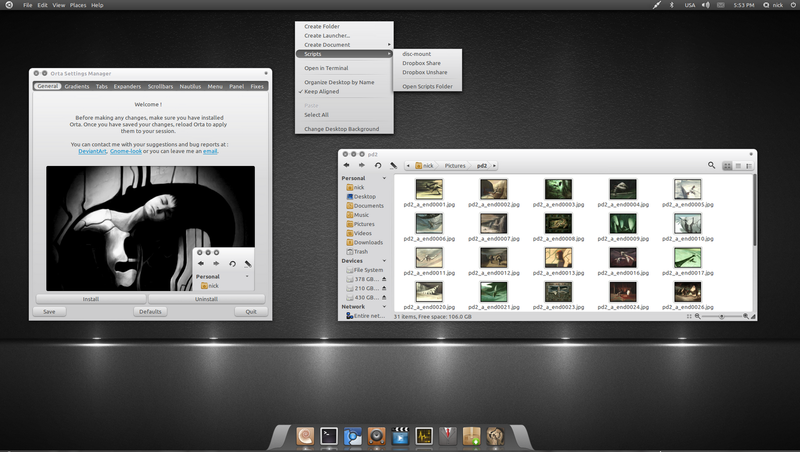 And if you are not using Ubuntu, visit Orta deviantart page. And if you like Orta GTK theme for Ubuntu, then you definitely needs to browse through our collection of awesome GTK themes and icon themes for Ubuntu.